c) Option C is to sell $500,000 worth of bonds paying 10% annual coupon rate, resulting in interest expense of $50,000 per year. The tabular analysis above shows the corporation will earn a higher return on equity (14.25%) if it expands by issuing $500,000 worth of bonds, even though its net income is lower than Option B, totalling $285,000 while Option B has net income of $335,000. Thus, the best option for this organization is option C which is to sell $500,000 worth of bonds and paying a 10% annual coupon rate with an interest payable of $50,000 per year. This above graph shows the raise of $500,000 via common class stock (Option B) & its associated rate of return of 13.40%. It also shows raise of capital via bond issuance and its return of 14.25%. 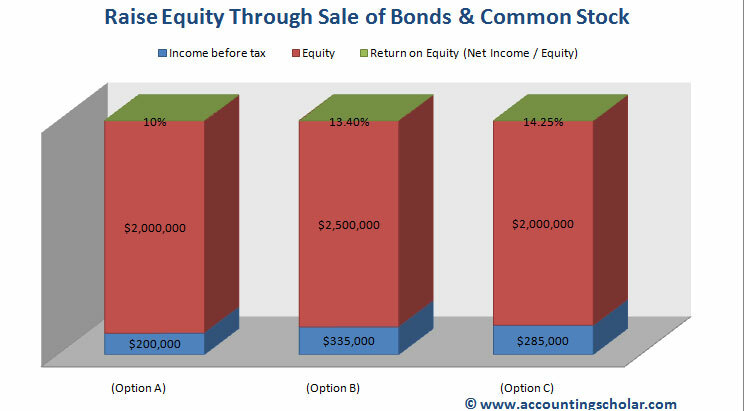 Note that the income is higher under Option B of common stock issuance ($335,000) while the issuance of bonds yields a net income of $285,000 however the return on equity calculation (net income / equity) is higher for Option C due to the $500,000 bond payable allocated to the liabilities section of the balance sheet, as opposed to it being put under shareholder's equity under Option B; you can verify this by checking the equity is $2,500,000 under Option B while it is $2,000,000 under Option C.